New domain extensions give you the opportunity to have keywords not only in your domain, but as your domain. For example, your domain could be pizza.nyc, cheap.computers, best.recipes or lifestyle.photography. Keywords in your domain name have a positive influence on search rankings when they match search terms. New domains mean new online real-estate. Now’s your chance to get an exact match on the domain name you want, with the added benefit of having a TLD that links your site right to your industry, community or interests. For example, artattack.gallery, urbanwear.clothing, or masons.construction. New domains offer new digital marketing opportunities. For example, you can increase your online presence and help customers find you by developing new mini-sites with quality information associated with your products or services, such as marsmission.blog, dogpark.app, or bikecourier.support. All TLDs will have an initial period, called a Trademark Priority (Sunrise), to give trademark holders the first and highest priority to acquire domains in the new TLDs. This is to prevent any domain squatting or other legal issues. We will have 30 days notice before this period begins for each TLD. Traditionally known as Landrush, this is a period of advanced domain registration, following the Trademark Priority (Sunrise), before becoming generally available. This gives eager registrants and organizations, that don’t have trademarks, an early opportunity to secure a domain in a new TLD. This phase may not occur with all TLDs. Move right to the front of the line with a Fast Pass. The Fast Pass moves a registration to the very beginning of the traditional first-come-first-serve sequence (General Availability) so the domain is most likely to be successfully registered. A Fast Pass is particularly valuable if there is no Priority Registration for a specific domain. First-come, first-serve! In General Availability the domains is open to the public and all registrations are processed as they are received. Note: Trademark Priority and Priority Registration are pre-registration periods and domains are not awarded on a first-come-first serve basis. Application fees for pre-registrations are non-refundable. Just pick the registration phase that is right for you and we will manage the timelines for you. So apply for the names you want, now, and we’ll let you know when your names are ready for you to use. in Trademark Priority. What do I need? that you have registered your Trademark and have fulfilled Sunrise eligibility requirements. So Many Questions... Maybe These Will Help! What is a new gTLD? New gTLD is the acronym for new Top Level Domain. The Top Level Domain is the domain that comes to the right of the dot. So .COM, .NET, .ORG and .BIZ are all Top Level Domains. Now there is a program that is ushering in a whole new slate of TLDs like .BIKE, .PHOTOGRAPHY, .MENU and .GURU. Now there is a program that is ushering in a whole new slate of TLDs like .BIKE, .PHOTOGRAPHY, .MENU and .GURU. Are all of the new domains available to the public? Most of the new domains will be available to the general public. However, some are brand names like .BMW and .ALLSTATE, which will likely be reserved for internal use. Some are closed domains that won’t be available to the public. And some will have rules governing who can and can’t own the domains so they won’t be widely available to everyone. Will the new domains change how the Internet works? No. But now it will be easier to find things on the Internet. It will also open up a lot more options for individuals and businesses can’t find good quality domain names in the current top levels. How much do the new domains cost? Cost for each name will vary. Prices are marked when you search for a domain. Why is the pricing so different from one domain to the next? Just like with .COM and .ORG, not all the domains are operated by the same organization. Different operators have different pricing models. Why would I buy a new domain? These new domains offer a lot of benefits. First, you may be looking for a shorter more memorable name that has been unavailable until now. Second, you might like to target different groups of people by identifying your site or your business as being part of a particular industry or geographic region. Third, non-english domains are being offered for the first time, so this is a great way to expand your global reach. Why should I pre-register domain names? Competition for new names will be high. Pre-registration is the best way to ensure you get the names you want. Am I guaranteed to get the domains I pre-registered? You are not guaranteed to get the domains you want. However the early in the process you register, the better your chances. Registration fees collected for new domains are fully refundable if you don’t get the name you want. When can I build a website on my new domain? As soon as the domain is in General Availability and we have advised you that you are the successful registrant, you are free to start using your domain for email and hosting a website. You can check on the status of your pre-registered domains in your Domain Manager. Can I buy a domain in a language other than English? Yes! For the first time ever, domain names are available in Arabic, Japanese, Chinese, Cyrillic, etc. This is a great way to start to expand your reach within the global community or build your international domain name portfolio. Should I consider registering more than one domain name? Yes. 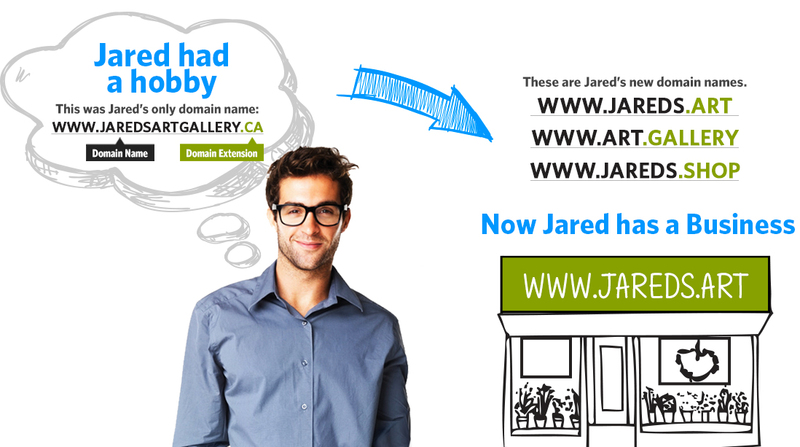 As you browse the list of domains you will likely find many that apply to your business, hobby, community etc. The more that you register the more you expand your online digital footprint. You can use the domains or forward them to your current site, making it easier for people to find you online. What if I need help pre-registering my domains? We have people to help. Just contact us and we can do it for you!